From Hockey to Headboards: (6) Keys to All-Star Interiors. Listen…I get it. I’ve said it before, and I’ll say it again…we’re a very different kind of interior design team. One part artistic workshop, one part specialty contracting company, and another part full-service interior design firm. We’re uncomfortable with traditional industry labels, as they never seem to capture the individual style and unique personality of each client…and from design to delivery we do business a bit differently. But that’s entirely…by design. I guess while so many design professionals, and self-proclaimed DIY experts, seem hard at work trying to compose the next staged style picture for their fans and their feed…we’re way more interested in composing great interiors for our valued clients. In an industry that can be obsessed with itself, and showcasing the coolest kids in the room…we’re simply dedicated to making our clients feel like the coolest kid…in every room of their home. And speaking of cool, the project I’d like to share with you on this terribly cold January day embodies that word in more ways than one. And is an example of what I’ve been hammering home on the radio for the past couple weeks. That outside of everything you’ve read, seen or been digitally fed, there really are only six keys to creating the perfect room. That’s right six. And…if your interior is missing any one of these elements, it’s probably never going to reach All-Star status. To illustrate these six keys I turned to one of our favorite projects; The Family Recreation Center. I know, it’s sounds like a YMCA or name your local municipal athletic facility…only this one’s a residence, has a red metal roof and looks like a modern barn. Sitting on the top of hill, in the middle of a Midwestern prairie, it showcases a swimming pool, an arcade/media room, a killer bar area, a massive Kitchen, sleeps as many as a small hotel…and, oh yeah…has a full-sized ice rink if you’re so inclined. But what makes this ultimate entertainment home so special isn’t only the materials, the amenities or the original aesthetic…as a limited focus on just those attributes would be a shallow, stylistic review of its coveted features. No, what makes this home so incredible is the amount of care, effort and personality that went into making it a place others could enjoy. Throughout the process of designing this project, the intention on the part of the homeowners was as much an invitation as it was an inspiration for themselves. “Wanna play?” It’s sound so simple right?! Interiors should be designed with intent and maximize their full potential. Something I think we all want for every room in our home, but is often times easier said than done. But with these six keys this homeowner nailed it…and you can too! 1.) Organization: Beyond the endless conversation involving confining the clutter, the baskets and bins, the labels and lamenting, is a discussion of a rooms true purpose. Proper layout and space planning, are the result of an interiors well-defined sense of itself. If you don’t clearly define the intention or purpose of a room, no amount of traditional organization is going to make it function the way it should. Design note: This all-in-one entertaining room (Kitchen, Bar, and Multiple Seating Groupings) was specifically designed to find a place for everything, but also look great with everything completely out of place. That’s purposeful flow. From culinary adventures to creative cocktails to great conversation…everything has a place. Evolve your understanding of the term “organization” to one grounded in finding a rooms purpose…and you’ll be amazed how much it can hold. 2.) Personality: The most interesting and complete interiors reveal something personal and important all in an effort to connect us to them on an intimate level. Have you ever dated a really good looking person that for a little while, seems to have it all together? But after a few more dates, you begin to realize you’re in a relationship with someone that doesn’t really have anything to say. Our interiors are no different. When style trumps substance in a room, you’ll tire of it sooner or later. Design note: It was evident from the very beginning of the project, that this space was going to have a strong personality and a little risk at the core of it’s design. From the complex use of patterned fabrics to the found objects personally curated by the homeowner on the shelving…this interior is as authentic as it gets. So much so, that even the oil paintings (See the image on the back of the Kitchen wall) are landscapes painted by the homeowners Mother. 3.) Durability: Contrary to popular opinion, durable-elegance does exist, you just need to know where to look. Fabric technology has advanced to the point where stains release easily from luxurious and natural looking fabrics we’re often at times hesitant to use. Embrace luxury textiles from some of the best mills on the planet, and look to use them in percentages that make a big impact for less cost. Design note: Allow yourself to fall in love with luxury fabrics and great fabric companies! Use them in the right percentages, and on the right elements, and it will pay off big time in the overall look of the design. Leave them out of the design…and you’ll always wonder what might have been. Great fabrics punctuate your design. So do well-placed nail heads by the way…as evidenced below. 4.) Flexibility: Remember the days when the furniture in your Mother’s Living Room NEVER moved. So sacred where the layouts to these rooms that only “company” was allowed to use them?! We really don’t live like this anymore, and neither should our rooms. The best rooms, like the best friends, can dress up and dress down in a moment’s notice, pull more people together and if need be move the party outside. We tend to downplay the value of small accent furniture, which allow spaces to expand and contract with our lifestyle. Benches, square ottomans and even occasional chairs that can enhance the fun and function of our rooms are must haves for the complete interior. And always remember to design your exterior environments with as much care and thought as your interior spaces. Design note: Design with well-scaled accent furniture and create additional groupings that can move around the room wherever they’re needed. And always look to utilize awkward corners and available space in front of windows…as the right piece can make these dead spaces come alive! 5.) Quality: Unfortunately, we live in an ever increasing disposable world…and our interiors are suffering because of it. The appetite for low-cost, stylish furniture, drop shipped to your house in less than a week has distorted the conversation of what constitutes quality in our interiors…and in our lives for that matter. This is where I like to explain The Design Coach Doctrine of Quality as it relates to interiors; It’s not about how much you spend, but rather where you choose to spend it! Fact, interior design products, especially upholstered goods that cost more are typically made better. That being said, you have to do your homework and discuss what matters to you most. No interior is built in a financial vacuum…so, figure out what you truly value in a room and apply your assets accordingly. And remember, it’s not a question of cost…but one of value. If a rock the size of a quarter costs $50.00, you’d never buy it. But if that same rock was a diamond, you’d be asking how many they have. Remember…value, not cost. But if you don’t really know the difference, educate yourself. Find out how, where and why things were made. Those kinds of quality details matter in the best rooms. Design note: Expose yourself to quality materials and design products. Educate yourself beyond the digital universe. Explore, touch, feel…inquire. The more you learn why something is priced the way it is, the more you’ll understand its value, and it’s place in your design. What’s more expensive? The sofa you’ll never have to replace? Or the one you’ll replace two or three times over? Don’t think it exists? Just give us a call. We’ll be more than happy to introduce you to our network of quality people and their amazing products. 6.) History: This one is simple, but it requires some effort. Like the wedding saying, “Something old, something new, something borrowed, and something blue.” the most interesting and complete interiors have hints of tradition. Not traditional…tradition. A sense of something that preceded its current design. Elements of, or items related to the passions of our past that we still appreciate today…and will for many years to come. We create our own history every day, and don’t forget to include those details in your design. Design note: An interior without a sense of the past is like someone who’s forgotten where they came from. Display the passions of your personal history. Look to create rooms…with roots. Stay warm everyone…you’ve been coached. Three ways to crush your Christmas this year! On the radio show this morning, and for most of November, I’ve been discussing my maturing Midwestern perspective on the transition from Fall to Winter, as well as Christmas and holiday decorating. The act itself, at least for me, is a way to calibrate my mind, body and spirit for the coming celebrations and gatherings – not to mention the more peaceful moments in between. The times when I tend to stuff my stocking of a brain with more reflective, authentic and nostalgic thoughts when not a creature is stirring… except maybe me… and my Jack Daniels on ice. It’s a combination of factors this year that have led me to a place of such comfortable cheer. Sorry, I got stuck in my Night Before Christmas narrative for a bit. Moving right along. I guess it’s just that for the first time in a long time, I feel even more connected to the spirit of this season… and feel compelled to personally crush Christmas. Maybe just like the drink in my glass, it all distills down to a sense of gratitude. For my family, my friends and an insatiable need (and occasional neurosis) to create something special. So in an effort to boil it all down for you, here are three ways to give your season’s sled the nudge it may need to crush Christmas in 2018. 1.) Adopt the “hospitality-mentality” this time of year. Think of yourself as the ultimate Christmas and Holiday Concierge. Remember your offerings do not need to be extravagant or expensive to be considered special… as it’s often times the personal and thoughtful details you introduce that are the most well-received. Think of your house and it’s amenities as the ultimate gift to your guests, and try secretly surveying them in advance to identify the things they enjoy in this special season. From food to fun, there’s nothing better than a “How did you know! ?” experience to warm the hearts of your family and friends. So, do a little homework… and design accordingly. After all, holiday parties have a reputation for moving people from the Naughty to the Nice list… and vice-versa. 2.) There are ZERO decorating rules during the holiday season. Anything goes! And I’m not just talking about your Christmas decorations. Consider pushing together groupings of mismatched chairs to make sure everyone feels welcome. I personally love the look of vintage spectator chairs… but folding chairs will absolutely do. Don’t have enough serving space?! Create a buffet with two saw horses, some plywood and an inexpensive, colorful Christmas tablecloth! It’s not really about the bar anyway! It’s about the bounty of beverages for all to enjoy. Create environments with careless disregard for your already over-thought interior. Surround yourself and your guests with as much decoration as your home can handle. This year, I suspended a collection of vintage sleds from the ceilings of my lower level. And you know what, I’m not stopping there. Really go for it this season! And consider decorating areas of your home that have not been blessed with the Spirit in Seasons past. 3.) There’s always room for a little more Christmas. Leaving alone the obvious “style manger” analogy, I’ve said it before and I’ll say it again…the most interesting interiors always leave room for more inspiration both large and small. Don’t let your design and decoration become static or stale. Always be searching for Spirit this Season in more ways than one. And there may be no better functional and decorative time of the year to embrace layering your look than at Christmas. A sense of authenticity should be baked into everything you do, everything you say and everything you display this Christmas and holiday season. So bust out the old photos and send them off to be turned into ornaments! Find creative ways to string together Christmas memories of the past in your decorating. Framing and displaying old family Christmas cards is an easy one. Reminiscing and laughing about our shared holiday memories connects us in so many ways. The design of your home should both facilitate and enhance those important and personal connections. Please remember to support your local, independent businesses this Christmas and holiday season as you search for inspiration. Now back to my projects at hand… enjoy your Sunday, everyone. More from our house to yours in the weeks to come. we honor the sacrifices she made to create them. we celebrate her life in so many different ways. And when we begin to rely on the lessons she taught us, that at the time of instruction we didn’t completely understand…it’s at that moment we realize she isn’t absent at all. We love you. We miss you. Thanks for still being there…and taking us to school every day. Happy Mother’s Day! Dedicated to my Mother, Nancy Elyn Sassano. Thanks for taking the time to coach me even today from the great unknown. Why the secret to marketing your small business…might just involve a rather big ball of twine. This past week, I had the extraordinary pleasure of speaking to members of the Wisconsin Bed & Breakfast Association, kicking off their annual conference at the Abbey Resort is Fontana, Wisconsin. Special thanks to Kerri Thiel, Ed Svitak and Susan Smolarek for connecting me with such a wonderful group! I must admit, my wife and I have often talked about how fun it would be to run our own Bed & Breakfast someday. And while for us it seems “fun”…I am in awe of the immense effort I know it takes to maintain, promote, much less decorate these types of properties. As a small business advocate, I started my speech by thanking them for the valuable contributions they make to their communities, as well as their dedication to delivering something unique to a modern consumer that can be a bit of a moving marketing target to say the least. It takes special kind of crazy these days to be in business for yourself. For those of you who are doing it…you know exactly what I’m talking about. And for those who have never done it…it’s almost impossible for you to completely comprehend the depth of the overall experience. The risk. The reward. The sense of accomplishment when it works…and the level of disappointment when it doesn’t. It was in that light that I shared with them some key strategies to help them compete in a marketplace dominated by big data and the digital dominance of the deal. The overarching strategy is fairly simple, not all that new, but it’s still something so many businesses miss in their overall customer experience. Here it is. The businesses that communicate and reinforce on a personal level, their value to customers…will win. So in my speech I asked them…are you doing everything you can to document, display and share the stories that make your business worth patronizing? Are you focused on establishing the kinds of human connections that define truly personal service experiences? Does the design and decoration of your physical location facilitate engagement with your value story? Or, is your environment, like so many I see today both personally and professionally, a hollow exercise in decoration that trumps style over the substance of the experience you offer? Now more than ever, you have to give your guests something different, something authentic, and an experience they’ll want to share with others. I reminded them it’s amazing how far people will travel to experience something they haven’t before. In essence, what was their “big ball of twine” experience, and did their design act as a catalyst for guests to REALLY engage with their story? The following is the shorthand of my presentation to the WBBA, that I believe has an application not only for other businesses looking to engage customers, but also for anyone interested in creating authentic interiors with a mix of both substance and style. Start by documenting YOUR original story: Rule #1-Don’t assume people already know it…or remember it. Do your homework. Dig up your history! The people, places and significant events or milestones that have shaped your establishments unique journey. No history? Newer establishment? Then tell the story of WHO you are and WHY you opened it. Sometimes that story is best one to tell. Grab everything you can find, photos, letters from guests, reviews, awards and articles. Do your research and get personal. Authenticity is often times the emotional currency that buys someone’s attention. Recipes and remembrances count…write it, photograph it, and keep it. You never know when you might want to use those items to create an experience. Again, do your research. Tell the guests the people, places and significant events that may have happened in or near your establishment. Local history offers an inherently personal and original experience. Maps are awesome. Both functionally and visually. Orient your guests! Encourage them to explore. Your staff needs to know the stories. Take the time to teach and train. Lack of knowledge of the inn and the area…equals a lack of interest in the mind of the customer. All of that great documentation can be turned into engaging artwork that helps the customer connect! Themes, legacy walls, weird collections…ALL of it matters. Think cohesive and curated. Framing and professional presentation is so important. A cohesive, well-crafted visual tells people they’re some place special. There’s a reason why museum displays look the way they do. Curate! Pay attention to detail, and make it easy for the customer comprehend your story. True hospitality means your guests shouldn’t have to work for it. Develop the relationship: Be mindful that every guest, every event and every micro-interaction with your staff is an opportunity to reinforce your story. Invite your guests to become a part of your history and continuing story. This is where social media posts, offering to take your guests picture, and a digital guest book are so important. These are automatic and easy opportunities to engage! Start your own, or promote tradition(s) that are unique to your inn and your area. When people travel they’re more apt to try new things. And most everyone enjoys an interesting tradition. Do you have a signature “When in Rome do as the Romans” experience or tradition? Ask for feedback on something more than a card or email. Think of customer feedback as a double sided coin. The information on both sides can make you more profitable. Yes, tell us what we’re missing? But also ask them to share one of their favorite moments. “Hope you enjoyed your stay.” Or “ Thank you for staying with us.” Is not a personal goodbye. Digital mailing lists and personal data, are the new currency of marketing. And small businesses can no longer rely on just their own charm, or the charm of their town to carry them to success. People forget. You need to remind them why you’re relevant…and that their next great experience is waiting for them. I guess in a way, our homes are our own versions of a bed & breakfast. Both should be designed to inspire excitement and relaxation simultaneously. And in this Season on Giving…what kinds of stories is your interior offering? 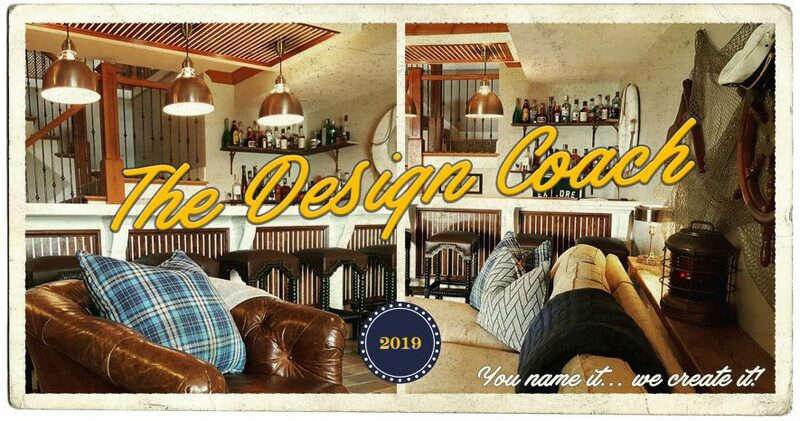 At The Design Coach…we can actually show you our big ball of twine. So gather up and display your special stories, and before your know it…you’ll be spinning them into an experiences people will never forget. “The wand chooses the wizard…” That’s the quote right? And it’s never been more true than here at The Design Coach. For those of you who have no idea what I’m referencing…you’d best move along to another blog. Or stay if you wish…however, be warned. Reading this may cause your face to awkwardly contort, as I deliberately disturb your consumer complacency…and poke any predisposed compulsion you may have for charismatic, cookie-cutter and catalog interiors. On the cusp of 20 years in business, we’ve recently come at an important realization that has put everything into perspective; like Ollivander’s Wand Shop…we’re not for everyone. And with every project, especially some soon to be revealed, we realize our true mission is to support those for whom the practice of interior design resembles more wizardry than Wayfair. Over the years, we’ve tried to reinvent our messaging to communicate who we are and what we do. That we are equal parts problem-solving contractors, original artists and visionary designers. A model, a team and a calling very different from the rest…met with the occasional displeasure and disdain of those who shall not be named industry purists. Most of whom, lack the basic understanding that true creativity in design, is best achieved by mastering the cross-training exercises that involve all three disciplines. You see, we have the power to concoct potions and elixirs to remedy any functional interior ailment. And we possess the ability to cast visual spells beyond everyone’s imagination with exception of our own. This is our purpose. The reason we exist. To help the world’s wizards realize and create that which they would otherwise not. Mind you, we did not ask for this condition…we were simply born this way. To thoughtfully position and pair…to sensibly select and synthesize…to carefully craft and create…to efficiently evaluate and edit. Differently than the others. So it would only stand to reason, that we are misunderstood by many…and dismissed by those who cannot…or in some cases will not…see us for what we really are. Mr. Potter and the hooligans of Hogwarts…we know exactly how you feel. Our creative home here in Lake Geneva, Wisconsin, located fairly close to both Chicago and Milwaukee, is surrounded by Cathedrals, Churches and Chapels dedicated to the religion of modern consumerism in every way. Featuring products, packaging and promotion that are often specifically designed to satisfy, rather than to nourish. From the outlet malls to the big box retailers to the discount stores in both philosophy and name. These are the kinds of places, where almost EVERYTHING is ALWAYS offered up in a way, that sacrifices quality at the altar of lower prices and the Great Sale. And then there’s us. Artfully curated, we still believe in the virtue of value, and that quality trumps quantity in so many ways. Shocking I know. But we understand the intrinsic value of our offerings…and those who choose to work with us. We appreciate the effort it takes to bring truly unique, original and well-crafted items to market…and you know what? So do our amazing clients for whom we are so grateful. Not only for their business, but for their overwhelming support of the not so dark arts. In our hearts, they are so much more than customers…they are both partners and patrons. For they are the ones who see wands…where others only see sticks. So every Saturday we open our doors, for the wizards who knowingly, and unknowingly wander in, searching for wonderful wands to add their collection. From couture fabrics to one-of-a-kind found objects, we live to share our brand of creativity in all of its forms, with those looking to put a little magic into makeovers both large and small. Funny thing is, every day that goes by, we get a little better at recognizing you when you walk in. Whether you realize it or not…just like us…you’re a bit different from the others. And deep down you know it. Sometimes giving yourselves away with your wide eyed-audible gasps, open jawed expressions that immediate morph into unsolicited smiles, and the sincere commentary that acknowledges the special place in which you believe you’ve entered. Other times you’re a bit difficult to discover. As the only clue to your true nature, is found in the pondering pace of your curious gait while exploring our shop. And even when your visit doesn’t result in a purchase, we love that there was still a very special transaction that took place between us…and we know you’ll be back. So here’s to the muggles, mud-bloods and pure blooded aesthetic alchemist of every kind, dedicated to more authentic, creative and personal interiors. May our passion, for forever fuel and enhance your search for the perfect potion and spectacular spell. The Design Coach: Wizards Welcome.